We source our grapes from the regions which have strong reputations for producing excellent wines. You can check out our apparel line, home goods, glassware, and hand-crafted products in addition to purchasing Bent Oak Wines by the bottle or case. We're located just west of Austin, Texas and are open on Thursday through Saturdays 11:00-7:00, and Sundays 12:00-5:00. Kid and leashed dog-friendly. Awesome wines selected by the winemaker are available for pickup or shipment four times a year. Join the waiting list below and get a 5% discount on wines while you wait to become a Lil' Pup or Lucky Dawg member. Coming to our tasting room today? We are open Thursday through Saturday 11 am to 7 pm and Sunday 12 pm to 5 pm. If you are a first time customer mention "Kodiak" to your wine ambassador and get $5 off your order. At Bent Oak Winery, our passion is to bring out the unique qualities from each region we choose as the origin for a Bent Oak Wine. At Bent Oak Winery, our passion is to bring out the unique qualities from each region we choose as the origin for a Bent Oak Wine. From the East Texas Range, West Texas High Plains, to California's Dry Creek Valley, Sonoma Mountains, and even our own back yard vineyard, our grapes are hand-picked, carefully sorted, and treated with the utmost care to preserve the essence of terroir from which the grapes originated. From dirt to bottle, Bent Oak Wines speak for themselves showing distinct balance, character, and taste. The Bent Oak Winery existential mission is to bring to our customers wines of distinction from the regions where those varietals are best grown. From Texas High Plains Tempranillo, East Texas Blanc du Bois, to Sonoma Mountain Cab, Bent Oak Winery offers a distinct lineup that will please even the most discerning palate. While Bent Oak Winery focuses on wines consistent with our customer demand, we are unabashed about stepping out of the box to bring forward unique varietals that are worthy of consideration. There's always something going on at Bent Oak Winery. We want to always be accessible to and learning from our colleagues and our customers. Share the Bent Oak journey: come to the tasting room and try our wines, check out the calendar of events, enjoy a short video from our winemaker, join our BOW-Wow Wine Club, follow us on Facebook, sign up for email updates, and check out the Get Bent merchandise. Bent Oak Winery is a proud member of both Texas Hill Country Wineries and of the Texas Wine and Grape Growers Association. 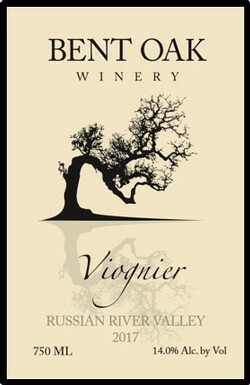 The Wine: The grapes for our Viognier come from Marsha’s Vineyard in the heart of the Russian River. This idyllic setting is perfect for allowing Viognier to fully develop both aroma and richness with floral, honeysuckle, jasmine nose and delicate apricot, passion fruit, and melon on the finish. Our sparkling wine blends two varietals, Trebbiano 75%, and Malvasia Bianca 25%, exhibiting light melon, kiwi, minerality with delicate effervescence. 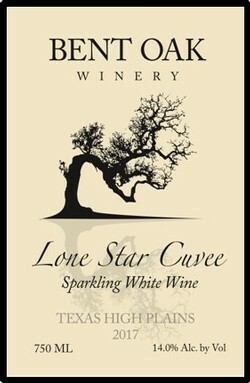 The grapes for both varietals originate from Bingham Family Vineyards in the Texas High Plains. Our Pinot Noir grapes come from Windsor Oaks Vineyard, just south of Healdsburg, California. 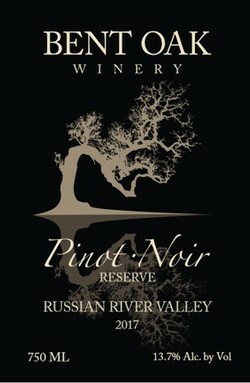 This vineyard splits itself between Russian River and Chalk Hill with the Pinot growing on the mid-elevation vineyard blocks. Our Pinot Noir is from Clone 777 grapevines and exhibits a rich aromatic nose full of black fruit, cassis, hints of leather, tobacco, and brooding earthy notes. We age our Pinot in older French Oak barrels that allow the wine to breathe and mature gracefully.